I finished work on Project 4: Developing Design Ideas a couple of weeks ago, so this review is well overdue. Partly the delay is because an earlier draft vanished into the ether, but more importantly it’s because even more than previous topics, this isn’t a thing that you complete and move forward. I want to – and I have to – keep working on this. I need to practise and repeat and extend and hopefully get to the point where it’s so ingrained in how I work that it’s become a part of me. Not automatic, because I want to work with thought and intention, but one of those tools which is so familiar that it fits your hand like an extension of yourself. Sometimes I can be embarrassingly earnest, but that doesn’t make the idea less true. Did you manage to ‘make space move’? Yes, in parts. Looking back at Stage 1, I now think I wasn’t very adventurous, but some examples in later exercises were moderately successful – and in one case I was able to recognise that space was moving rather too much and sliding off the page! What are your thoughts about the drawings you did in Stage 3? As mentioned above, one had a problem with balance. Others I still find interesting and have developed further. Over the months of doing this course I have become much more relaxed about drawing and painting. It takes off a lot of pressure to see them, and the resulting work, as one step in a process, not a finished or polished thing in themselves. Plus it doesn’t have to look like the thing I’m drawing. Further design work could change it out of all recognition. In fact I’ve found that less “realistic” images are often more energetic and easier to develop. Were you able to use your drawings successfully as a basis for further work? Are there any other things you would like to try? It was definitely a struggle at times, but I think some of the work I showed here is really interesting and has possibilities. I hope there will always be more things I would like to try. I’m very happy with the inclusion of computer-based work, which I think is a good addition to the “toolbox” of techniques and, well, tools. Now that you have a good working method, do you feel confident that you can carry on working in this way independently? I can’t really claim to have a good working method yet, but I definitely have the beginnings of one. I’m going to have to keep returning to this, keep working on it. I expect there will always be grinding times as well as flowing times, but I’d like to change the proportions! I am confident that I will be able to keep working on this, able to keep improving and learning. 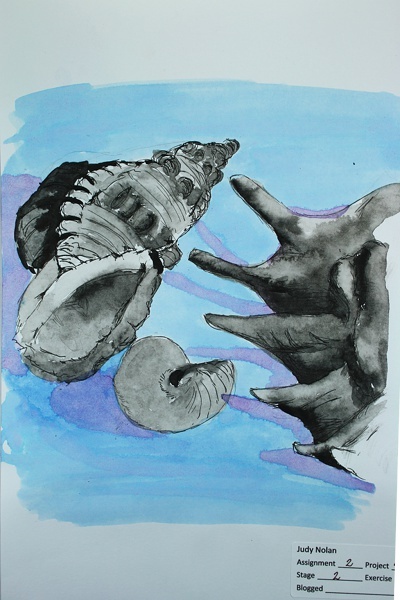 In my sketchbook work starting 9th February I worked on an idea based on one of my shell sketches. I tried various iterations and developments over a few days up to 16th Feb, and to an extent was able to follow the general working method. I didn’t reach a fully resolved design, but more material was developed and I may well return to it in the future. In the last post I struggled (at length!) with selecting interesting areas of drawings for development. Next step of the method is of course the development, and for this I used the small shell section. Below I’ll show and discuss some of the variants, but the full set are on the sketchbook page starting here. 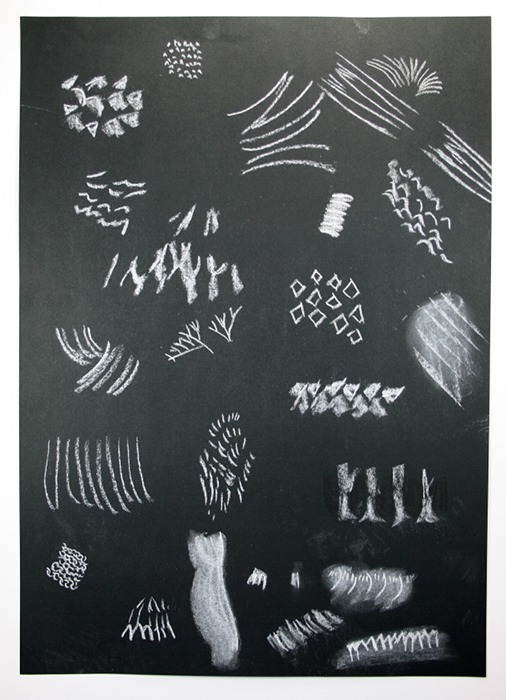 First identifying lines and shapes using charcoal and working large (A3) and quickly. Still thinking about lines and shapes, but moving further from the original and introducing some colour using conté crayons. 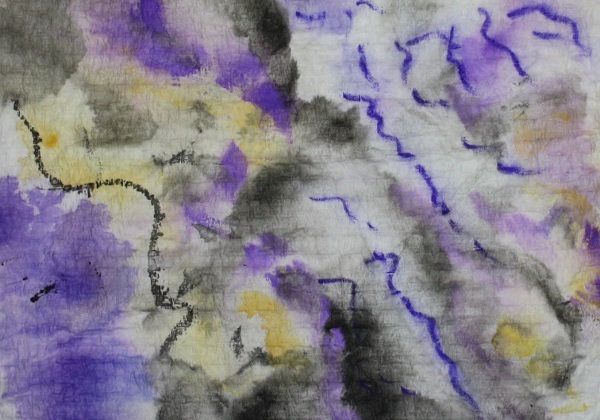 Next I moved to wet media, and started with pen and purple ink, thinking I usually enjoy that sort of work and find the results interesting. The results were not interesting. They were so not interesting that I got out the acrylic paints and totally covered them – producing a result which I liked even less. The black and white image shown here was an accident. I was processing a photo of the acrylic horror to put on the sketchbook page and accidentally hit the Colour/Threshold function. I think it looks like a woodblock print and I really like it. The lower right hand corner is pretty boring, but the rest could have possibilities. This is hindsight and a chance variation. At the time I was annoyed with the work, annoyed with myself, and wishing my inner critic would take a hike and give me a break! The next attempt was again acrylic on A3 paper and added nothing new. I’d lost focus and control. After a pause to regroup I tried again, this time working smaller (A4, and not the full page), starting with inktense pencils (which are becoming familiar and comfortable). It was really a return to the original image, larger and somewhat simplified, trying to identify what had caught my interest in the first place. After another false start I got to the black and red version (brushtip pen and crayon). Finally I felt I was getting somewhere. During this whole period I’d also been spending time playing with photos of my sketchbook work. Gimp makes it easy to select areas, crop, flip and scale, plus lots of filters such as kaleidoscope, tiling, pinch & whirl etc. It doesn’t replace working with originals on paper but it seems to me a very valuable addition to the toolset. I scanned in the A4 page, and this is a cleaned-up version of the black and red drawing. By this time it was last Sunday evening and the work week was looming. I only had time to try a few variations, such as this tiled version which I think would look good printed on cotton and used in a summer dress or skirt. Finally it happened. On Monday evening on the bus home I’d stopped reading and was vaguely looking out the window, when I suddenly realised I was running through variations and experiments in my mind. What if I inverted the colours and combined the positive and negative versions of the the motif? What if…? Straight on the computer when I got home, and the ideas kept flowing. 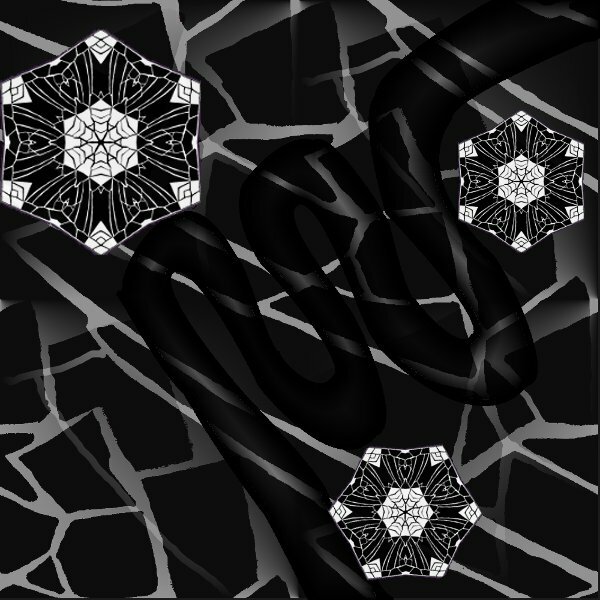 I inverted, rotated, tiled, kaleidoscoped… Then I decided to try putting some elements together, using one of the frameworks developed earlier in the course and recorded here. The Map/Seamless function created the background. The medallions used Kaleidoscope, then resized and one of them rotated a bit. I tried using a few different sets of parameters in kaleidoscope, so that each medallion could be different, but it became too busy. I created the shape of the curved “pathway” using the Paths tool. I’ll need to practice to get a smoother result next time, but this was good enough to get the idea. I worked through lots of options to create the fill – solid in various levels of grey, graduated shading, outlines etc. The solids all took over a bit. This version is a graduation with reduced opacity so the background shows through. I wouldn’t call this fully resolved, but I can see it interpreted in nuno felt, maybe free-machine lace medallions. An alternative could be hand or machine stitching on a felt base in dark thread. It could be used for a cushion or maybe a cover for a laptop. 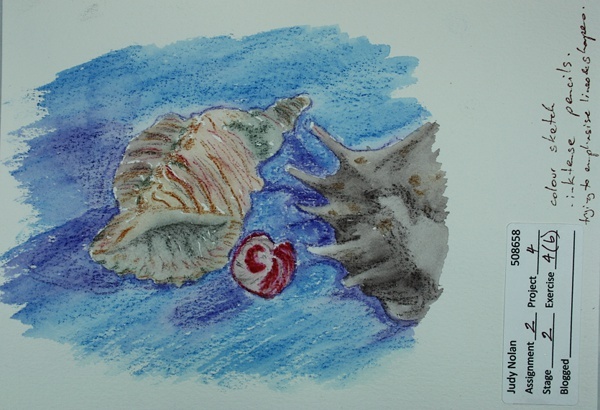 Feeling on a roll, I then worked on a different shell drawing, using some similar ideas. I like the result of the Seamless filter, which Tiles producing opposing light and dark diagonals. 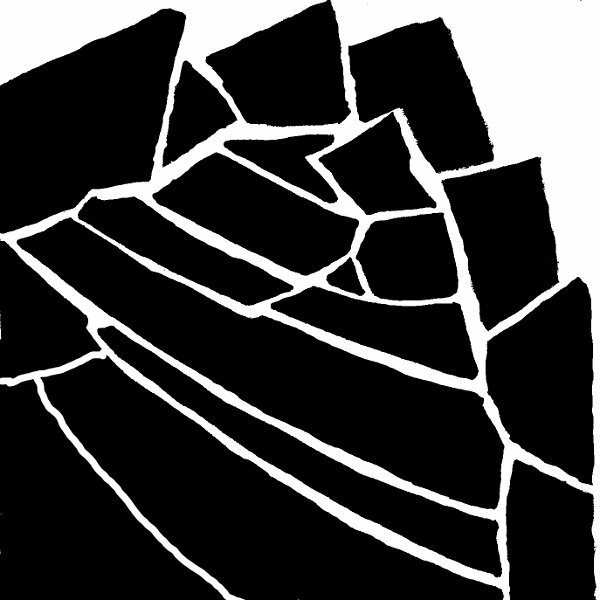 It needs some smoothing and fine-tuneing, but I can see this digitally printed on a silk and used in a light jacket. I finished the evening with a brief sketch of how that could work, feeling refreshed, invigorated, and relieved to get to one of the flowing periods after a time of grind. I’d really been looking forward to Project 4 Stage 3: Selecting from your drawings; and Stage 4: Developing design ideas. I’d read ahead in the Assignment notes and these Stages seemed really pivotal, bringing together all the skills and knowledge that we’d been building up and putting them to use together. With an introduction like that it’s clear where the story is going – I struggled. My 3-day a week job has been really hectic and 4- or 5-days a week since late last year and when I managed to make time for OCA work energy and enthusiasm were low. During this time I read an anecdote in Itten about a sculptor, one statue convincing, the next a failure “because he had approached his work tired and without concentration, and had tried to achieve with his will power and intellect what one can achieve only through intuition and a free feeling for rhythm” (Itten, page 98). Darn. Itten later writes of the value of relaxation exercises and other preparation, but being un-relaxed and un-prepared I only saw “The painter must wait until he feels an urge to create” (page 110). Double darn. Not really an option for a middle-aged part-time student juggling way too many balls, and while the particular details of demands and commitments vary, most people I know are in the same situation. My solution to this is to keep grinding on when the going’s hard, and look forward to and appreciate the times when it flows. I’d be happy to hear others’ ideas! Selecting from your drawings and Developing design ideas are exactly as the titles say. First look through all the sketchbook work, searching for areas with interesting and dynamic combinations – potential for further development. Then work with selected areas to develop them – which provides you with more material to select from and develop. It’s a clear, systematic, iterative approach to design work, and all the exercises up to this point give the tools and skills required to apply it. An exhilarating flow can be achieved, as imagination, intuition, feelings and objective assessment combine. Or, at times, they don’t. When I started Stage 3 a couple of weeks ago I got out all the sketchbook and assignment work I’ve done since last August. I spread it out on the floor, put it into piles, ran L-shaped frame finders and mirrors over pages – and hated everything. 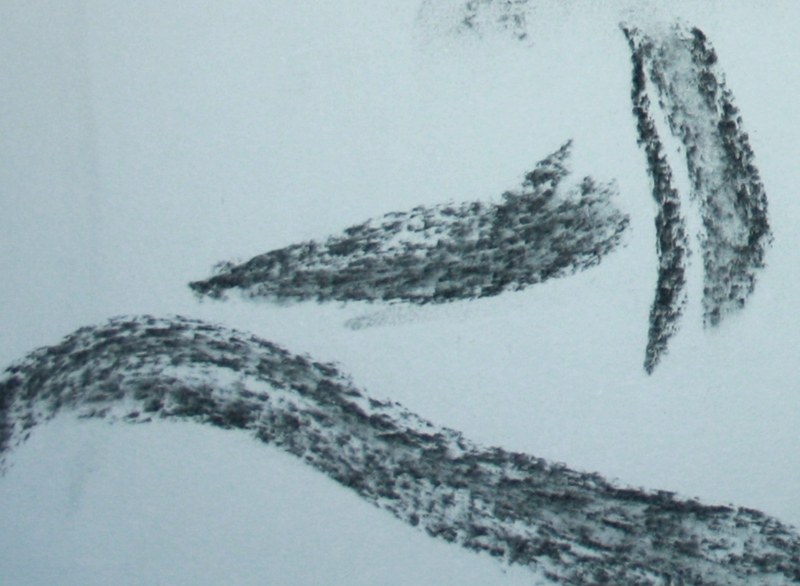 I noticed the faster, more energetic things drew me, not so much careful “drawings” – but still no excitement. I created and printed a list of potential sources of contrast and harmony from Itten (proportion of various things, hue, saturation, texture etc), and tried again. Still negative. I tried warm up sketches, reducing distractions. I remembered that I have an unhelpful habit of over-thinking things and tried to simply Trust My Eyes. I found reflecting sections in mirrors gave very static results, more useful in my mind as a component than a design, which led to thinking about components and elements of an end design, versus the overall design. 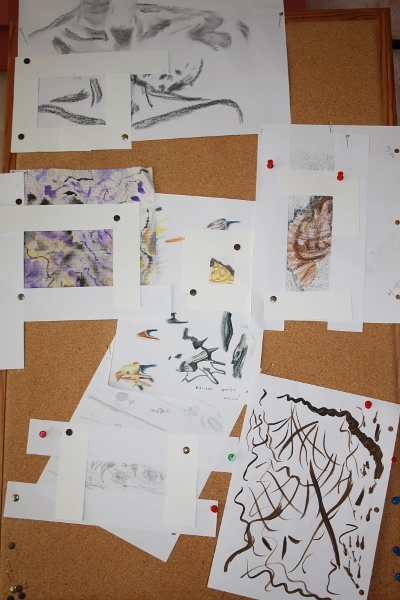 This back-and-foward went on for a week or two, and finally I had a pinboard full of drawings with areas roughly framed where I thought there could be potential for further work. The board was visually very confusing – it’s propped up in a position so I can look at it as I’m moving around the house, and it was difficult to pick out the chosen areas. Since I’ve photographed pretty much everything, it was a quick fix to go into gimp and for each drawing crop out the selected section and print it out. Here are the selected areas. 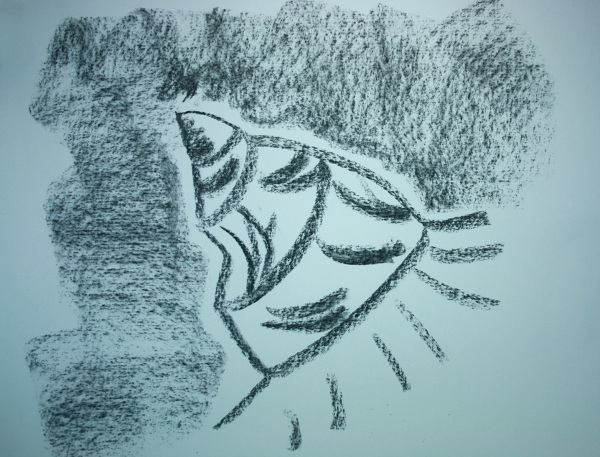 I like the broken quality of the lines (original was charcoal) and the contrast of light and dark. There is a sense of space and peace. The top left area doesn’t work, but something about the way the shape fills the space and the area around it appeals to me. There is some contrast between curves and more angular lines, plus some contrasts in scale. I get a sense of a contained and closed area, and a more flowing section which doesn’t have a complete boundary, which I find interesting. I selected this section trying to get a horizontal alignment of objects across the centre, with a diagonal top right to make it more lively and less static. Looking at it later, it just seems to be sliding down off the page. I chose this image mainly for the colour combination, but I also find the quality of the marks and the contrast between areas of colour and lines interesting. 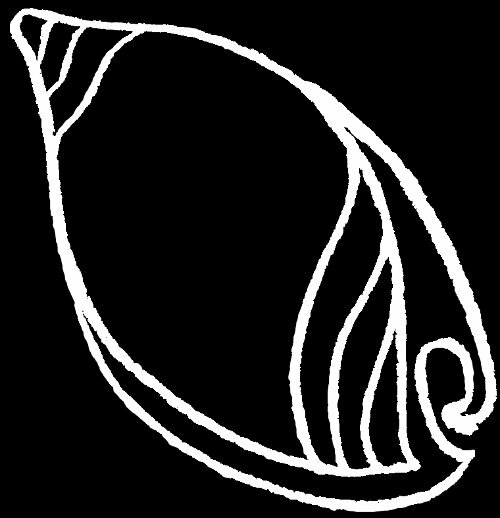 The final selection is part of a shell. I did some editing in gimp to continue the dark area around it. I find it quite an ambiguous shape, forceful. So by this stage, last Saturday, I declared Stage 3 done. I haven’t finished the story, but this post is long enough, so To Be Continued. Finally I decided it was good enough, if not exactly exciting, and I started with charcoal, separating out lines and shapes. Throughout this exercise I found it difficult to draw just the area that interested me, and overall this is really bland. If I screen out the rest and just look at the the central spaces between the shells I find it much more successful. Next I moved onto A5 watercolour paper, using inktense pencils. Once again I lost focus, both in terms of the area I was drawing and the particular element of colour. Looking at it now there is a lot of line and shape information. However if I can get past the clumsiness of the middle shell, which is dreadfully wrong, I can say that the colours, while not objectively accurate, are satisfying to me. I don’t actually find the “real” shell colours very interesting. Next up was in theory texture. Off track again, I was thinking a lot about the positive and negative space in the centre, and spending a lot of time playing with shading to indicate form. Again, trying to look at it charitably, I can say the relative roughness of the lefthand shell and smoothness of the righthand one are apparent. The final drawing. I used ink with pen and brush. 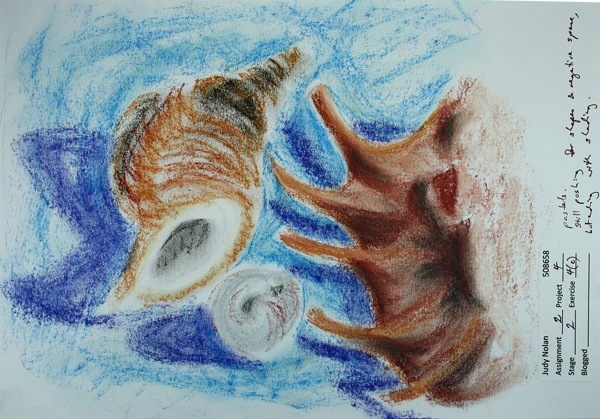 Once again I need to frame out a part of the drawing to get to what really interested me – the central space with the different shapes of shells and shadows, the contrast between the surfaces of the different shells. I like the effect of the flat background colour contrasting to the grey-tone and line volume of the shells (apart from that dratted middle shell!). In terms of creating a satisfactory finished drawing this exercise is a failure – but I don’t think that’s the point, given this isn’t a drawing course. In terms of using a good method and process, part of developing design ideas, I’d rate it a bare pass. I wasn’t able to stick with my focus and point of view, I can’t neatly line up each preliminary sketch with what it was meant to be investigating… but in the process I did learn and see more about my subject, there are parts in all of them, particularly the final, that I find intriguing and I think could go further. Nothing as it stands could be directly translated into textiles, but I think parts will be seen again as I go through the course. Plus I’m now quite happy about drawing real objects – I can approach it with some confidence that I will get what I need – raw material for design development work and new visual knowledge of the world around me. The last time I posted about actual OCA assignment work was in late December. I can be confident that not a day has gone past that I haven’t thought about it – the one thing I’ve been able to maintain is at least at little sketchbook work every day (started 14 Dec, so 39 days including Jan 21). This weekend I’ve finally been able to get some time together. I had produced a design and really liked it – so much so that the next step, doing three more drawings based on the first one, was really difficult. The distance in time helped. I also was very clear that I wanted to base the new drawings on the old, not reproduce it. I wanted to see if pushing further even when you’re happy with something helps to find new possibilities. 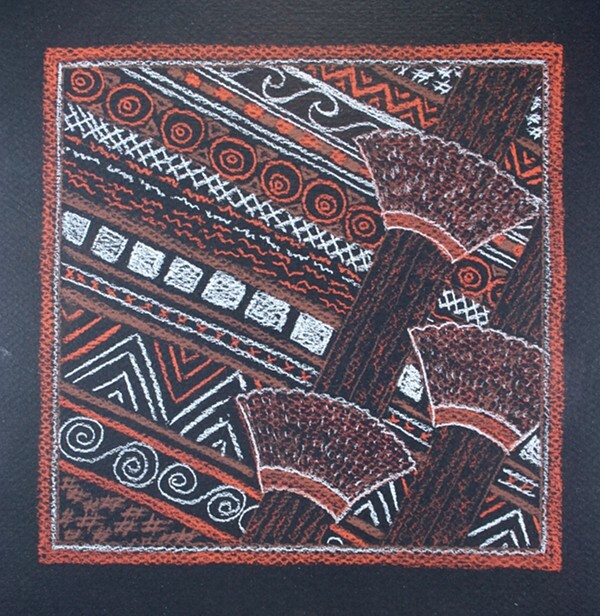 Version 1 uses dry media – conté pencils on black watercolour paper. The instructions were to keep one’s point of view clearly in mind while working. I wanted to focus on pattern and texture development within the very rigid geometrical grid. The end result is still very close to the original, but I think successful in the texture and pattern focus. 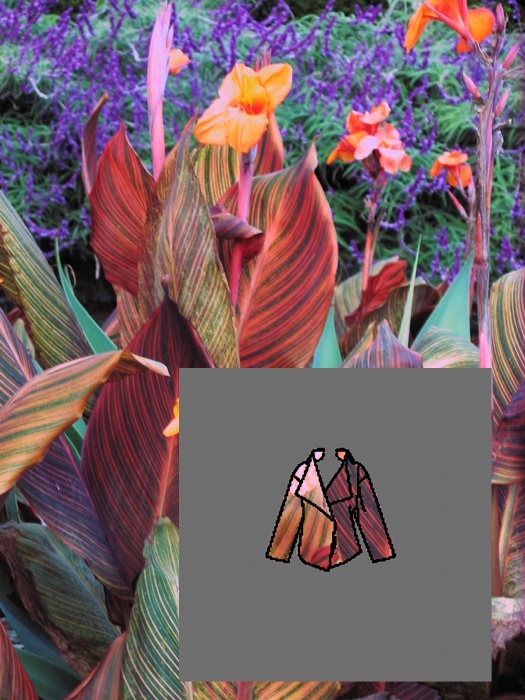 It now looks much more “stitcherly” in nature, while the first looks like a graphic print. The columns are now much less distinct against the heavily patterned “background”. I considered putting some white onto the columns to give them more presence, but decided it would all get too busy and start fighting for attention in an unpleasant way. Version 2 asked for wet media. This gave me lots of trouble, in large part because the original was in watercolour (? or gouache – can’t remember just now). My first idea was to move away from the heavy geometry to a more organic, less controlled image. I wanted to use watercolours to form those hard drying lines to make the patterning of the background. This went very badly – way to much water around for a start. 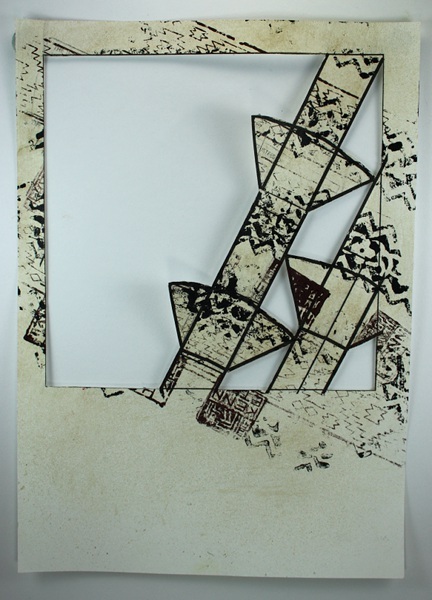 The end result was ditched as an assignment exercise, but recycled into sketchbook work. You can see it here, but it’s still unexciting. 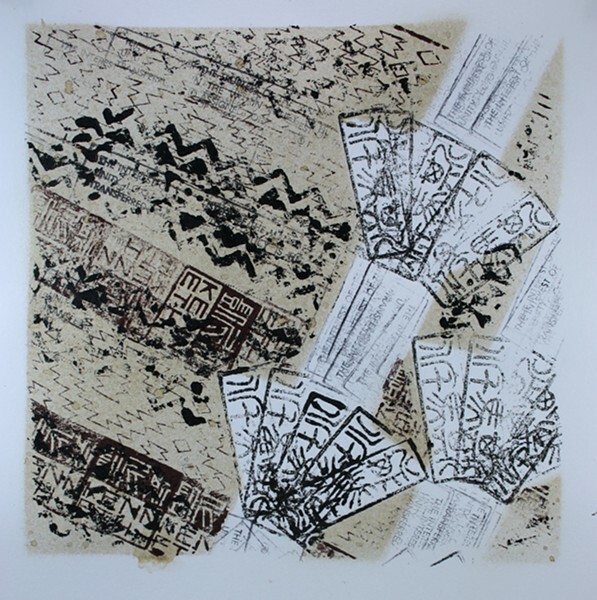 Plan b was to continue the focus on patterning, this time using stamps to create the texture. First I created a cardboard stencil, to protect areas of the image while stamping. Since I had it, I used the stencil to gently colour and texture the background with sprayed, diluted, sepia coloured ink. I have a motley collection of stamps gathered over the years. This image has some chinese stamps carved with my sons’ names, a couple of (maybe indian) wooden blocks, and a variety of business stamps that were being thrown away at a workplace. 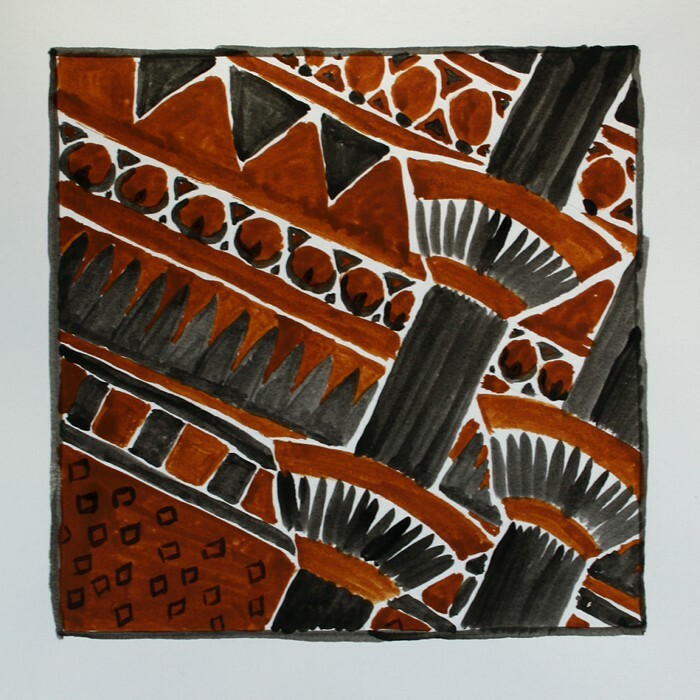 I used acrylic ink (black and burnt umber). Ignoring the clumsiness of various things, I find this result interesting. I like the reduce colouring, which makes apparent how strongly coloured the previous versions were. The columns don’t work well, but I like the overlapping and incomplete stamping on the lightly coloured background. Some very nice marks there. I like the result on the stencil too. I think the colour combination is one to use again. The image on the left is another experiment. To create the stencil, I used my stored photo of the original design, and using gimp created a layer with all the major lines. This was printed onto a light card and I cut out along lines as required – you can see some of the construction lines I didn’t need on the stencil under the stamping. Further work within gimp produced what might be an e-stencil (I just made that term up). It’s made up of layers, and I’ve put in a screen grab of my layers dialog hoping it makes some of the following clearer. The bottom layer (ignoring an info layer where I’ve put some reminders to myself) is the background or wall. 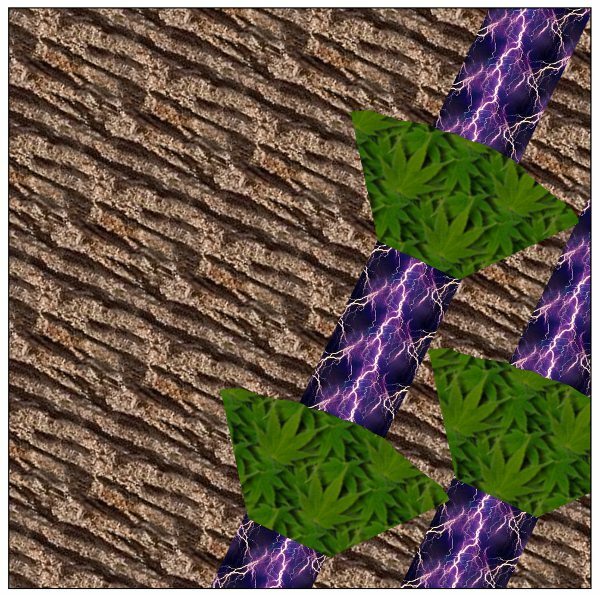 In the example shown I filled it with a stone pattern (extra detail – to get the slope of the pattern right, I created a separate image and filled it with pattern, then rotated that image by -64 degrees before selecting a square, copying and pasting into my background layer). Next up is the column layer. It has two parts – the layer and a mask. The mask controls which parts of the layer are actually seen. 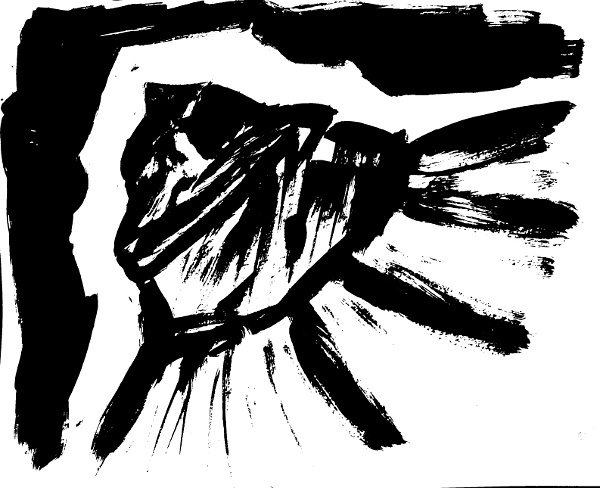 Where the mask is black, the layer is blanked out – it doesn’t show in the end result. 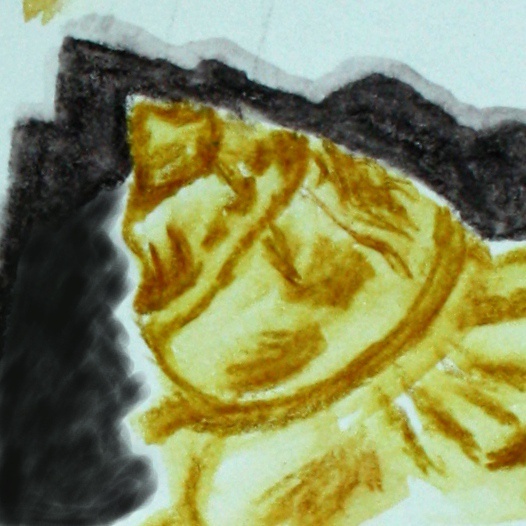 I have the column shapes in white on the mask, so that part of the layer will be seen. I used the same technique as for the background, this time using a purple lightening pattern and rotation 26 degrees. The purple lightening columns are seen on top of the background. The spray decoration is another layer, again with a mask so only selected areas of the pattern are visible. 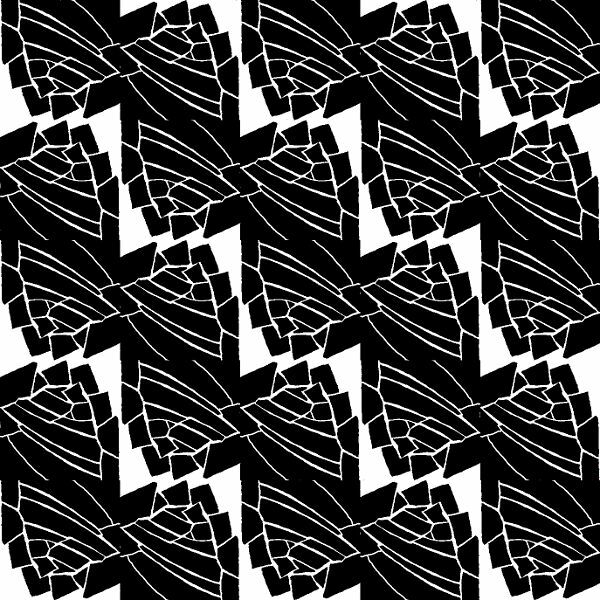 This time I rotated the pattern by eye to get what I wanted (there’s nothing magic about the other rotation amounts, just what works for this particular design). Finally I have a layer at the top which puts a little frame or border on the image. I now have a file which can be used to audition colour and patterning ideas for the design. I could even scan or photograph some fabric and use that in a simulation. Back to the assignment. 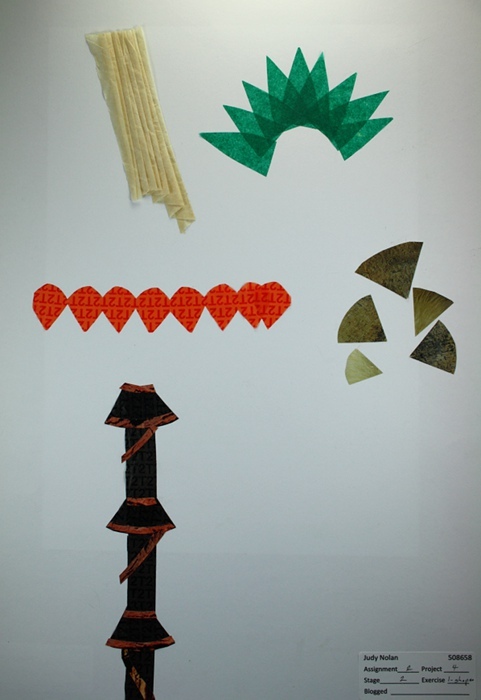 The third media was collage materials. I used some calendar and magazine images, plus some tissue paper from a shop. The black spray area is actually a calendar photo of lava (maybe?) by Frans Lanting. I think this is the least successful variation. Perhaps there isn’t enough contrast between background and columns, plus the different background images don’t meld well. It reminds me of patchwork, and if it really was it would need significant stitching to reinforce the directional lines and perhaps differentiate texture – say leave the columns relatively unstitched and slightly puffy. Hopefully in all of these my textural/pattern point of view is apparent. I’m still mulling over my texture questions from my earlier angsty post. I emailed my tutor, Pat, who gave some helpful advice and reassurance. The other day I came across a book in the library, “Capturing texture in your drawing and painting”, and have been reading through. It’s full of techniques in all sorts of drawing and painting media, some interesting stuff that I want to try out… but I’m beginning to get the idea that you get so involved in producing an image that a lot of the freedom and gestural mark-making gets lost. It all gets very controlled, which might be fine if I wanted the image as an end product, but perhaps not so much as an exploratory, resource building for other work exercise. A lot of the stilted problem is due to being a beginner and it all being new to me of course. Always more to learn and think about. Warr, M. (2002) Capturing texture in your drawing and painting London: B T Batsford Ltd. Stage 2 is progressing. After the preparation in the last post (here) I ventured into the first exercises. 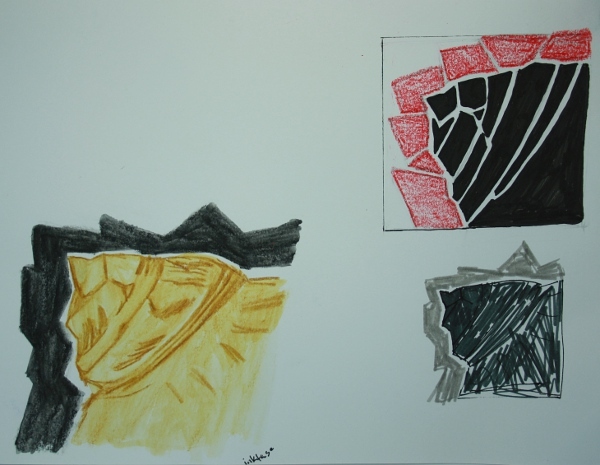 Exercise 1 asks for 3 quick drawings, based on a favourite image from the preparation work. I chose the one I used when framing jacket outlines, from Tutankhamen’s Treasures by John Ford. 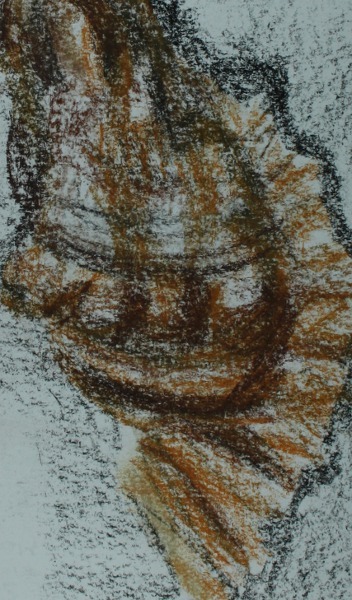 Drawing one is marks expressing surface textures in the image. Using black paper and pastels seemed a good fit for the original image. It’s not clear in the photo, but I used grey and blacks as well as white. 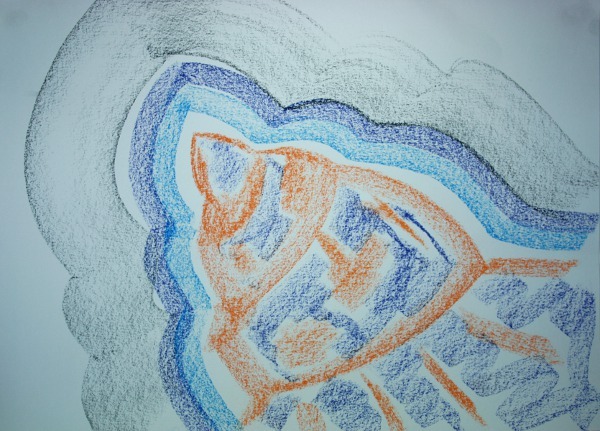 Drawing 2 focuses on colour. This was quite challenging, given my source image has a limited range of colours. 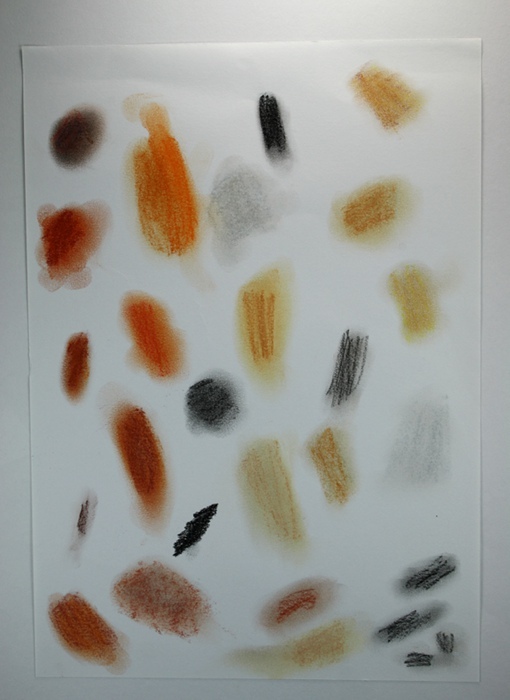 I stayed with pastels, blending various oranges, terracottas, whites, grey… As I worked with the image I found a lot more variation in colour than I had first realised. The course notes suggest 10 to 15 minutes for each of the drawings, and that felt about right for the first two drawings. Drawing 3 is all about shapes. There’s not much to show for almost an hour’s work. I wanted to try collage, and while I’m improving I still tend to get into a sticky mess. I’m pleased with the fine pleating in white tissue paper for the drapery, and got the effect I wanted in overlapping tissue paper – even if I had to go right outside the colours of the image to find a tissue with the transparency I wanted. The notes suggest being inventive to find my own way of recording shapes. I just hope to keep improving. Even at current skill levels I’m pleased with the results. Following the steps definitely helps me to see the original image in more detail, sharpening focus. On the bus this morning I was mulling over the relevance to weaving – although at the moment I’m quite happy to explore in other textile disciplines. On the weekend I read an interview with Rezia Wahid here, who responded when asked how she designs “It’s quite an organic process. I do lots of sketch book work first, but it’s not structural so there’s lots of room for freedom during the weaving process. 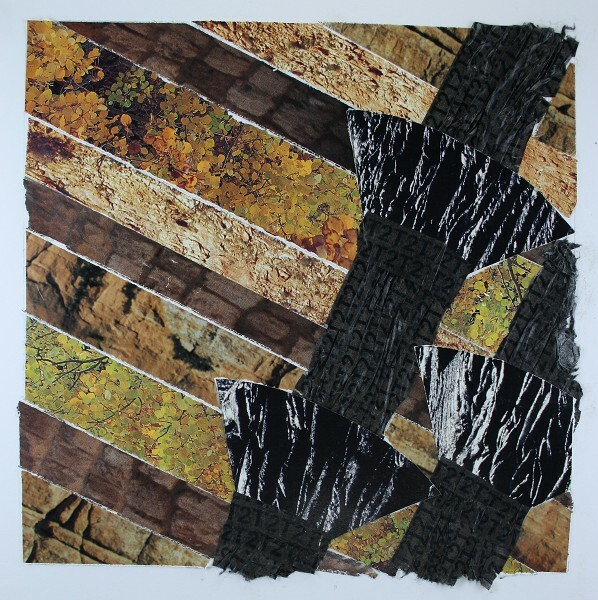 The weaving is a journey, but there is an inner sense of reason behind it.” From her website http://woven-air.com/ I gather Rezia uses ikat dyeing and a form of inlay called jamdhani. I’d love to see her work. Clearly very accomplished weavers (non-tapestry) use work in sketch books as part of their process. Back on topic. Exercise 2 asked for a drawing – a personal response to the image, being careful to emphasise my own point of view. I realised that my previous exercise was all based on the image as a whole, rather than a marked off area. In a way this liberated me, because the emphasis on what was important to me and the need to be selective meant I now felt free to adjust what I was seeing. I selected an area but it just didn’t feel quite right. After playing around with a mirror, then drawing off shapes onto tracing paper and simply turning the paper over, I found shapes and pattern that interested me. I really like the end result, created using watercolours on cartridge paper. The framework of lines at right angles was crucial and I spent quite a bit of time ruling up an outline in pencil. 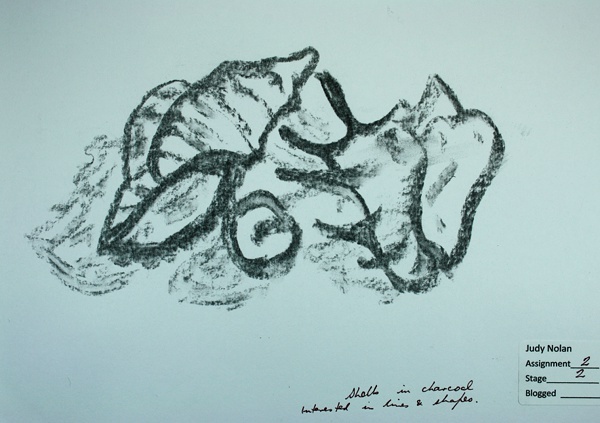 Colour has been simplified – just the ochre and black on white paper. There is some texture, but the focus is clearly on shapes. Some of the patterning is direct from the original image, a few parts were improvised especially around the two rows of round shapes, where there was too much white and I created some filler shapes rather than using a tint of the ochre. In fact I am so satisfied with the result that I’m a bit reluctant to move on to the next exercise, which asks for three more drawings based on this one. The Cunning Plan is that by documenting progress to date I’ll be able to let go, move on, and see what’s around the next corner. This next section of work has a lot to it and I feel the need to take my time, exploring possibilities. I haven’t got far yet, but already feel the need to record and reflect on progress. The task is to take some images and use a frame to select arrangements of shapes, thinking about what is interesting, active, generates visual tension, or is dull and cluttered. For base images I scanned a number of pages from a book about Tutankhamen and printed them in gray-scale. I then used tracing paper and a chinagraph (high wax) pencil. A couple of these I looked at the finished result and couldn’t see what initially excited me (for example second row right and bottom row left). 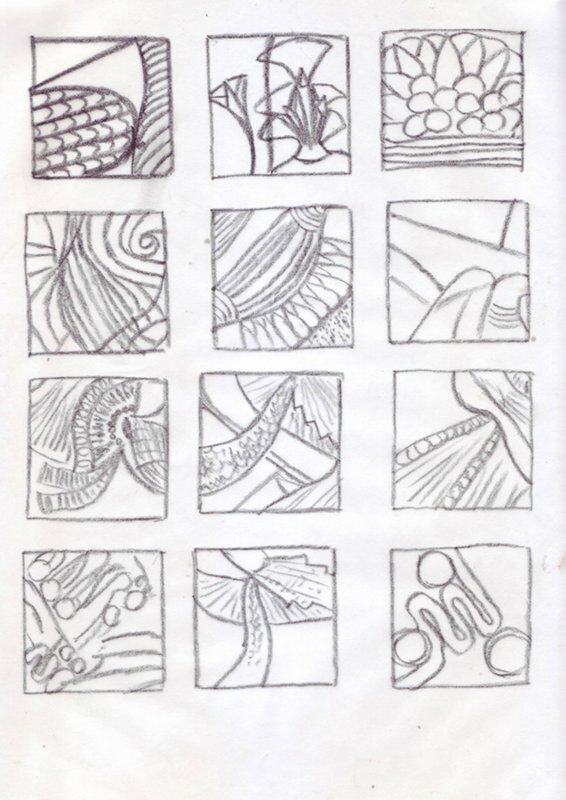 Others I like, perhaps with minor adjustments (for example bottom row right, rotated 90°). The notes suggested experimenting with different shaped viewing frames such as garment shapes. I wanted to try a specific garment shape – a Vogue pattern by Marcie Tilton that I’ve bought but not used – using the computer. The main reason for this post is to record my steps for future use, plus think about the pros and cons of the method. 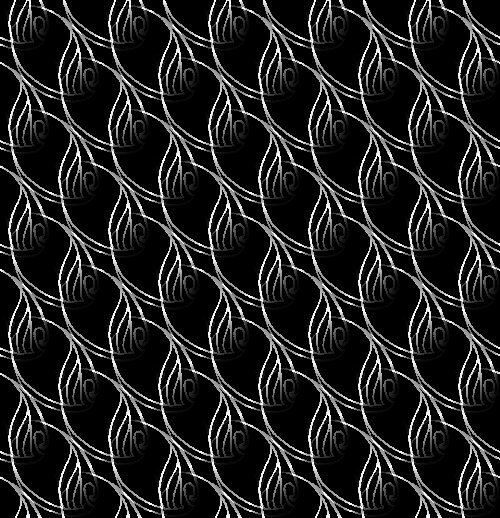 Get an image of the pattern line drawing, here. select by colour the white areas inside the garment. Delete (so they effectively become transparent). at this point I saved the result as a new file (.xcf, which is the native file format of gimp, my preferred image manipulation software). working with the frame layer, move, scale and rotate to view different areas of patterning. I also played with the colouring of the base image, desaturating and doing a colour inversion. One of the things I like about this method is that I can build up a collection of standard pattern outlines for future use. It was a matter of moments to open a different image (an old favourite from the Botanic Gardens in Sydney) and reuse the frame. Overall I think no real con, as long as I’m careful to develop paper-based as well as computing skills. The underlying purpose is developing my own visual awareness and for me both paper and computer have a place. Ford, J. 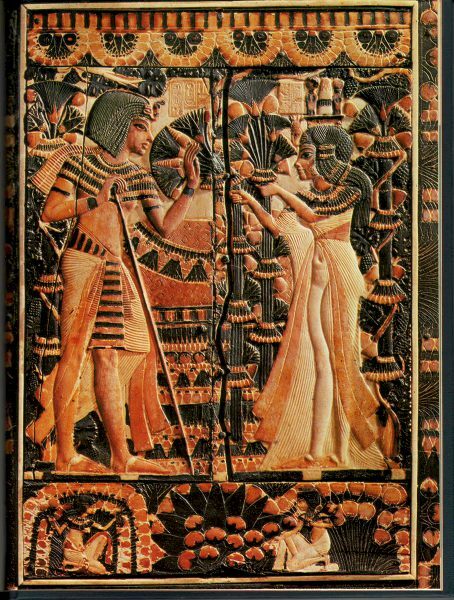 (1978) Tutankhamen’s Treasures, (Albany Books, London). Note to self – check proper referencing.